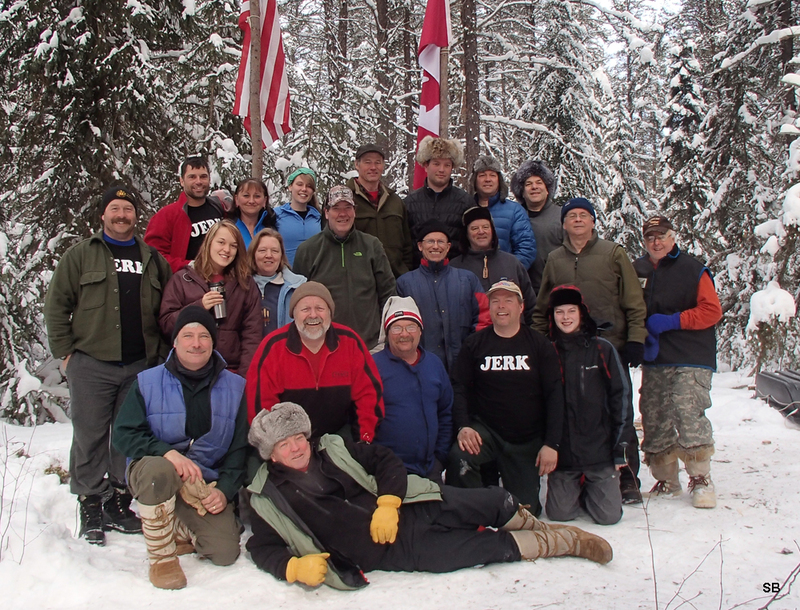 Well another year had passed and the annual gathering of the winter camping enthusiasts known as the “freezers” had gathered for the 12th annual “Deep Freeze” north of Sudbury, Ontario. Once again we would be travelling north on the Budd Car to the Nitro Creek drainage area for 8 nights/9 days of outdoor living in mid February. Saturday dawned clear and cold as we gathered at the Sudbury train station to pack sleds and toboggans in anticipation of loading the baggage car and departing on another adventure. As usual, the Budd Car was somewhat delayed (about an hour) in arriving to load. There was the usual assortment of passengers heading to various destinations along the line, our group of 23 plus another group of 9 winter snow trekkers heading up to the Missanaibi area to begin a 100+ kilometer trek across lakes and along the Missanaibi River to the main CN line where they would be picked up by Via’s transcontinental train for the ride back to Sudbury. This group was a commercial trip lead by the owners of Lure Of the North, a local Sudbury company.You can access photos of their trip on the Lure of the North's Facebook Page. Once loaded we were off on our way and arrived at our drop off around 11:30 where we quickly unloaded our gear and watched the Budd car slowly pull away. 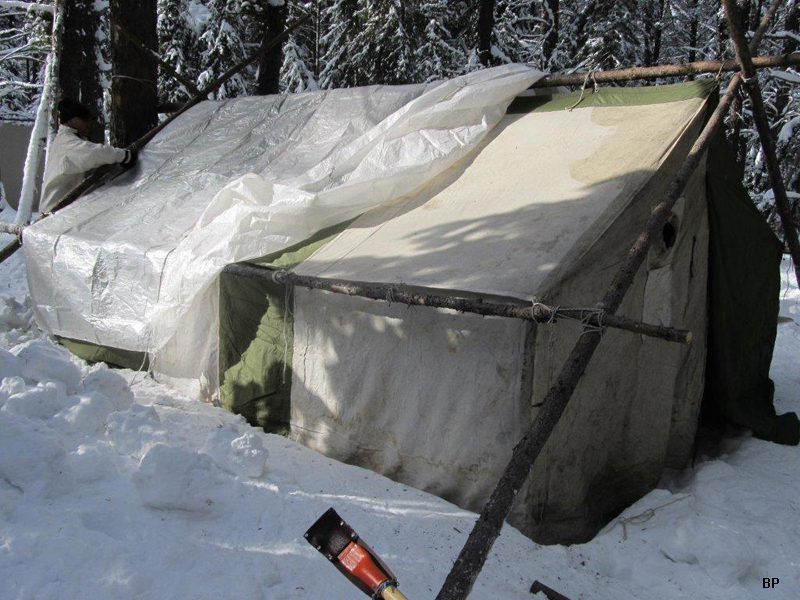 There was much more snow this year and it took a bit of trail breaking to get a good trail to the camp area set with a bit of open water below a beaver dam to complicate things a bit! 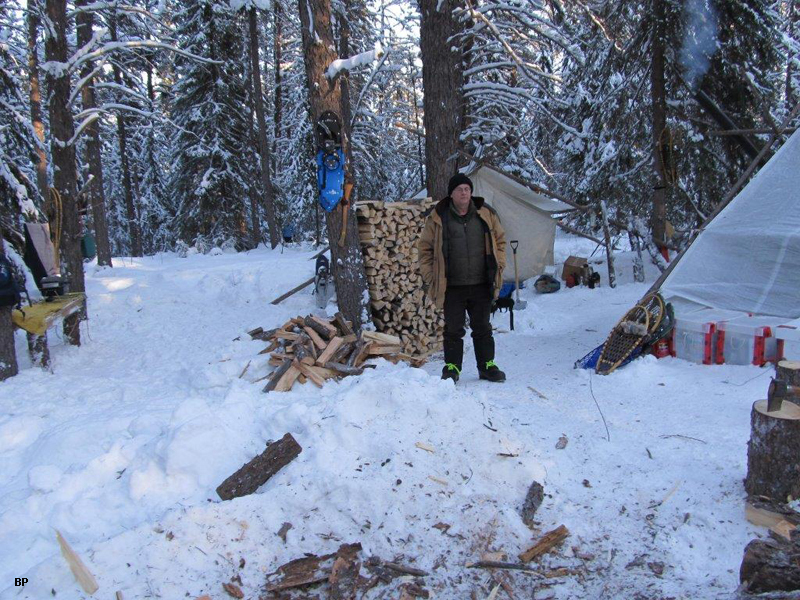 The rest of the day was spent setting up, opening a water hole in the creek and getting enough firewood for 8 hot tents to get through night and breakfast on Sunday as the forecast was for a cold night! 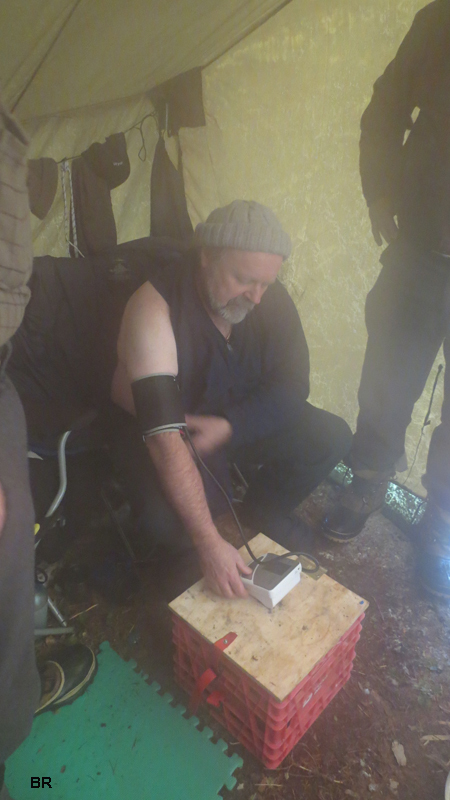 In fact, it got down to -32 C, which was one of the colder nights we’ve encountered in the last few year. The "Smokey Lounge" inhabitants tried something different this trip with all of us bringing a cot to sleep on. 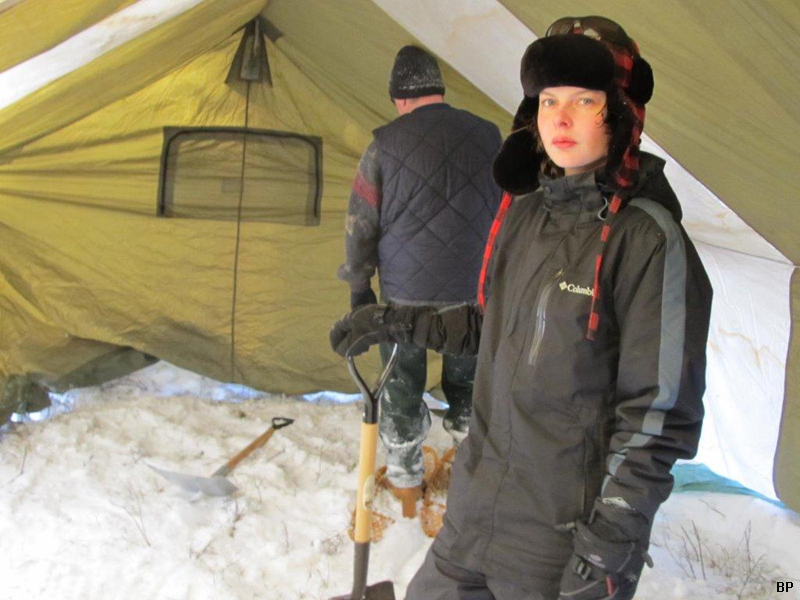 This meant we had to set up the tent (10' x 14' nylon/canvas hybrid wall tent) and then dig out the snow down to almost ground level. 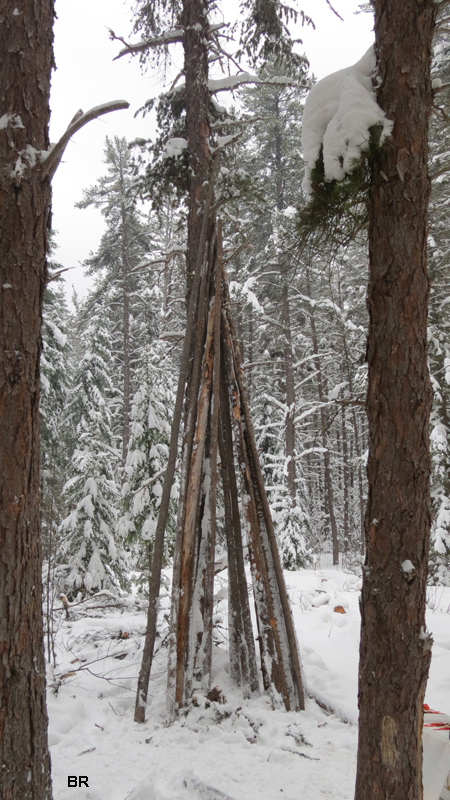 This allowed us to set up in a "U"shape pattern around the exterior walls with 1 cot in the middle at night. Everyone agreed that we all slept better and it gave us much more living space during the day for cooking/eating/socializing. Preparing the interior of the "Lounge"
The "Smokey Lounge - Bar and Grill"
Day 2 is traditionally spent tidying up the camp area and getting in a substantial wood supply for the week. A nice stack of firewood! The water hole, which had sucked a couple folks in for a wet foot was rearranged with a log bridge to span the creek and ensuring no further mishaps. Once chores were done a few folks passed the crisp afternoon with a hike to one of the many small lakes in the area. As is usual the rest of daytime activities for the week consist of hiking, ice fishing, socializing, bird watching, reading, naps – whatever! It is a no stress, relaxed trip for sure. Several of our attendees are starting to get along in age and one new activity involved one participant’s daily blood pressure check! This in turn led to everyone having a turn one morning, I’m happy to report that everyone at least had a pulse! Still working, guess I'll go fishing! Things were in full swing when we found out on Tuesday shortly after noon that the Budd Car was down with compressor problems and wouldn’t be running for 2 days. This presented 2 problems – there was a group of approx. 13 folks who had planned on coming in Tuesday and heading home on Sunday and we had 4 people in camp who were supposed to leave on Wednesday! 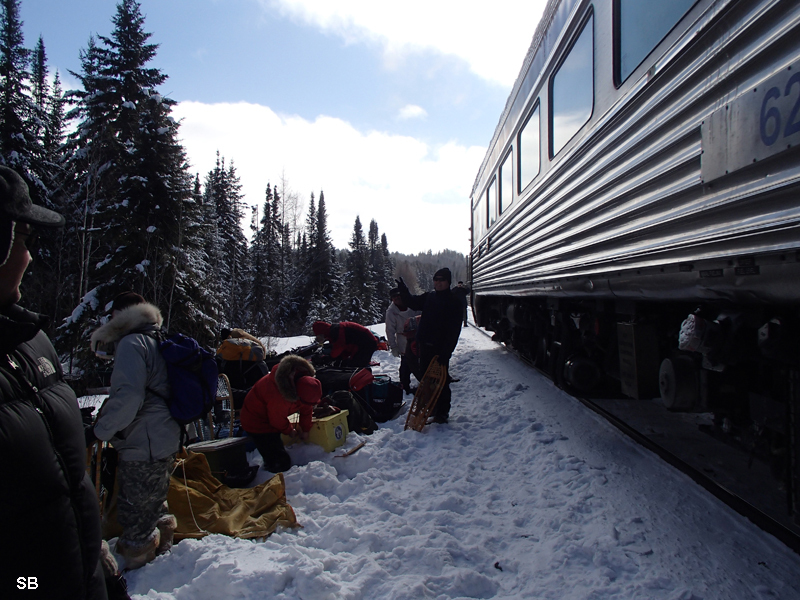 12 of the folks decided to head for Killarney Provincial Park and the 13th was to try to get in on the Thursday train. That still left the 4 outbound folks and the dilemma of what to do. 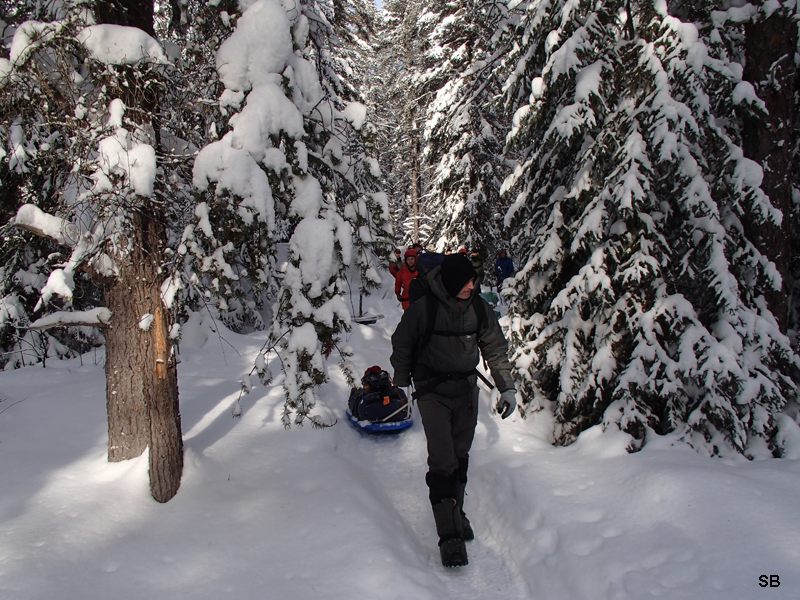 The Nitro area is about 11 km up the track from the nearest road access or you can hike 10km across country to the highway, either option is not that appealing especially when there is deep snow, slush on the lakes and you’re pulling your gear on a toboggan or sled. In the end they opted to walk the tracks to Benny and were picked up by Joe’s wife Carol and dropped off at their vehicles at the train station. Oh yeah, we kept their gear and would bring it out for them later in the week, sparing them the necessity of dragging their gear down the tracks. Sure is handy having a sat phone available to sort out these kinds of problems! Fortunately the train was repaired and ran on schedule for the rest of the week. Thursday is traditionally the day when the “Dawg House” group has hosted a wine and cheese party. This year it was decided to turn it into a “pot luck” event to spread out the preparation duties around the whole camp. Since the train did run on Thursday, Al M. made it in with his guitar strapped to his sled ensuring it would be a potluck with entertainment. 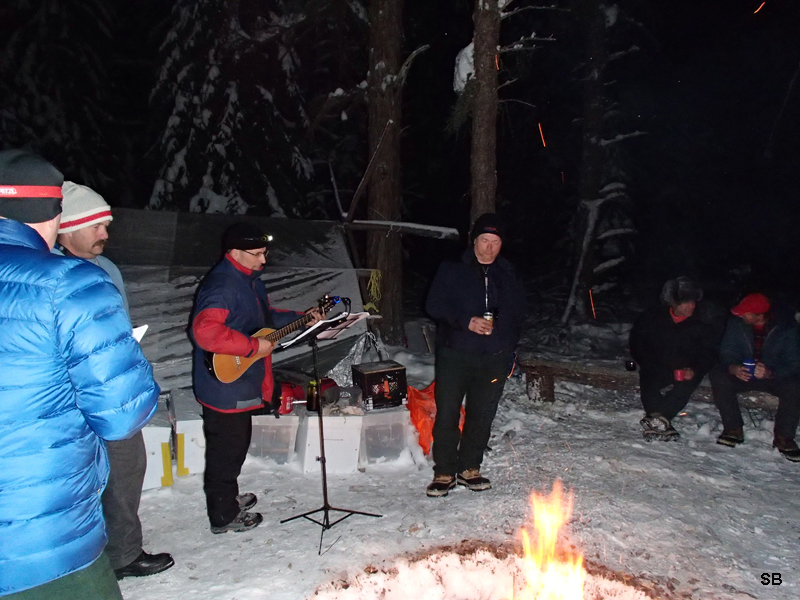 Al has attended quite a few Deep Freezes and always puts on a good show and sing along for the group, playing in all kinds of conditions – mostly cold! We’ve had colder nights but Al played for about 2 ½ hours and we finished with an a cappella rendition of Stan Roger’s Northwest Passage, that never fails to involve the entire group. Friday dawned with more snow flurries and with another group preparing to leave. They spent the day packing and cleaning up their tent areas and we all hiked out to the tracks to see them off. However, it was cold wind blowing and snowing and the train was late so we said our goodbyes and headed back to our tents and some supper, while they huddled around a fire inside the bush line waiting.... The train finally showed about 2 hours late and quickly loaded them, gave a blast on the horn and then there were only 9 of us left till Sunday. The"Freezers" minus Daniel, Rob and the two Kevins! 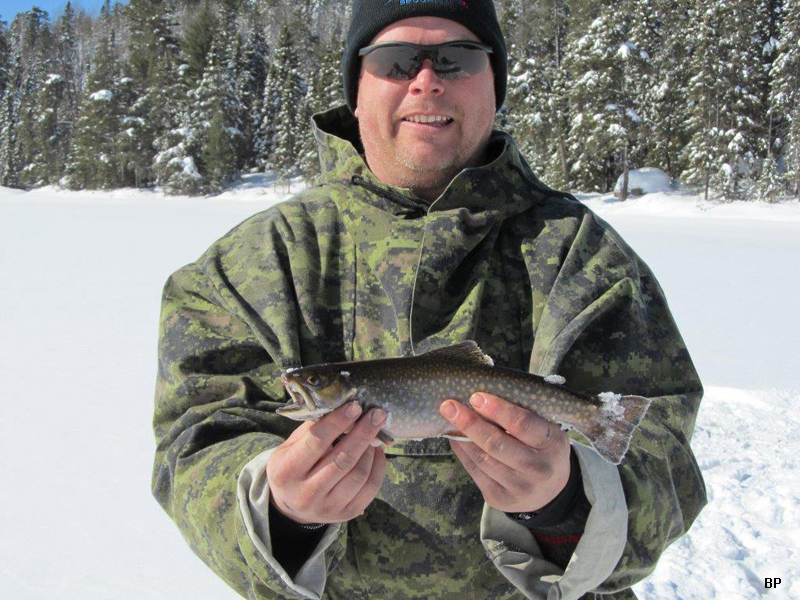 We spent the next day fishing and hiking and Al played again Saturday night but inside a nice warm tent for a change. 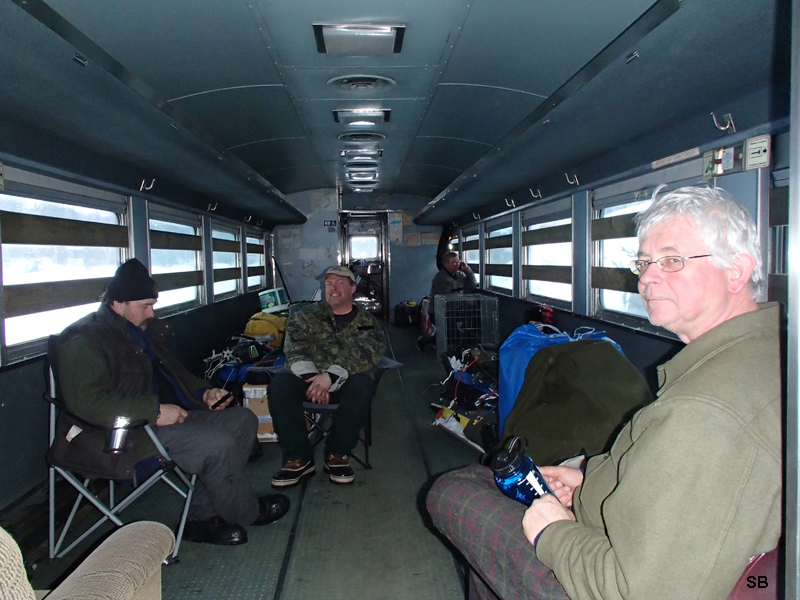 We had a leisurely breakfast Sunday and slowly packed up camp aiming to be out at the tracks for 4:00 pm for a 4:30 pick-up, it always helps to be positive about the Budd Car. We waited and the train was only about 40 minutes late for us and with minimal freight train activity we arrived back in Sudbury in daylight for change. Well all things considered it was another good trip that could only have been improved with the Budd Car running as scheduled. We certainly missed the 12 folks who didn't make it in to camp on the Tuesday, although they did have a good trip into Killarney. The folks who walked out on Wednesday sure wished the Budd had been running! 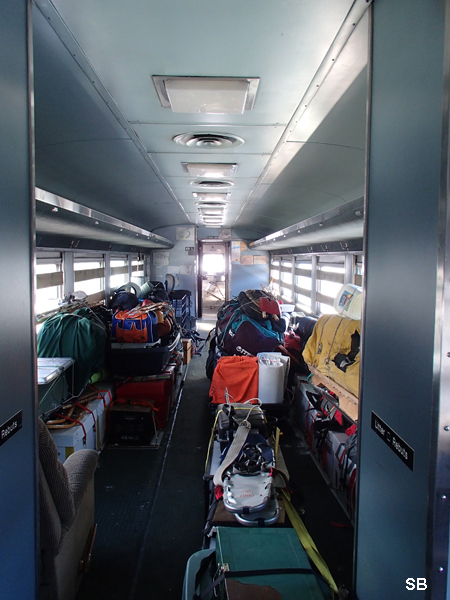 It's unfortunate that VIA hasn't seen fit to upgrade the Budd Car coaches and baggage cars to ensure a more reliable service especially in the winter months. 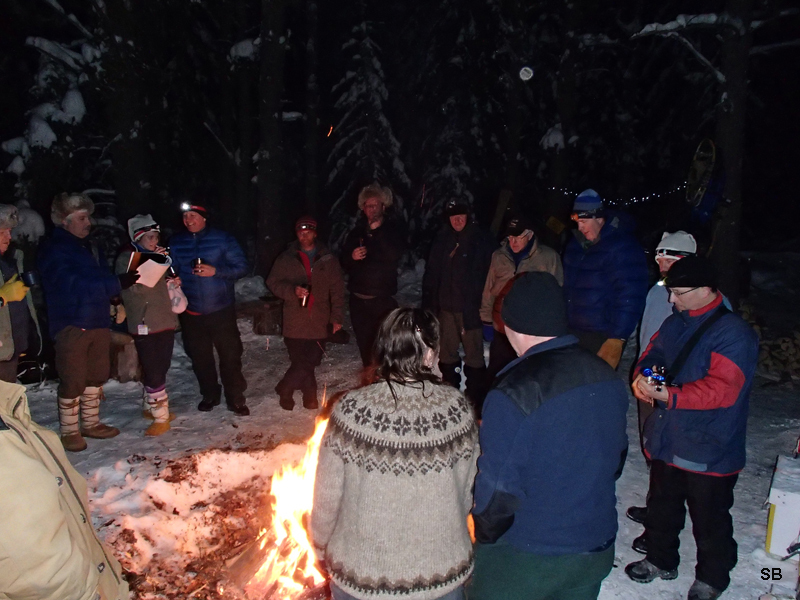 Sadly, this group will probably look to an alternative area(s) to carry on the Deep Freeze tradition where we can access the camp via road etc and not be dependent on a sadly deteriorating service. 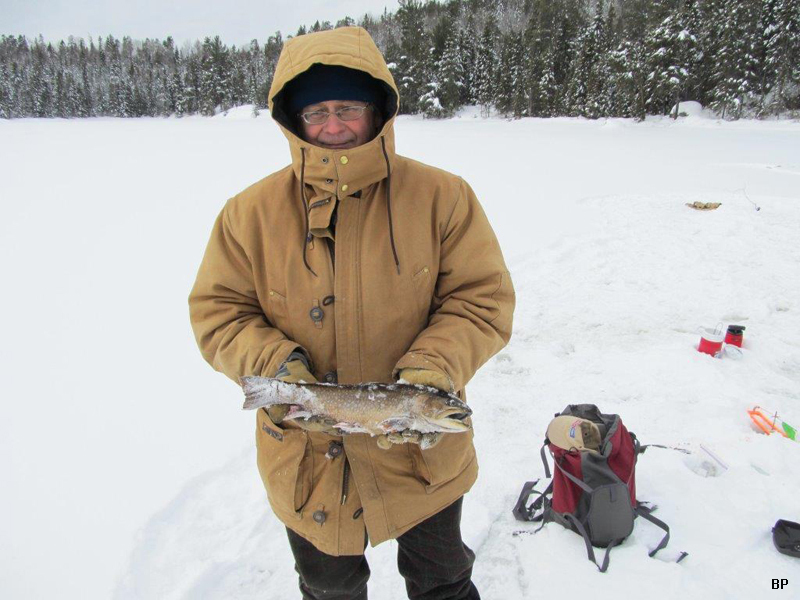 Stayed tuned for information regarding the 13th annual Deep freeze in February 2014 sometime next fall.